Many breast cancers have estrogen receptors and growth of these tumors can be stimulated by estrogen. In postmenopausal women, the principal source of circulating estrogen (primarily estradiol) is conversion of adrenally-generated androstenedione to estrone by aromatase in peripheral tissues, such as adipose tissue, with further conversion of estrone to estradiol. Many breast cancers also contain aromatase; the importance of tumor-generated estrogens is uncertain. Treatment of breast cancer has included efforts to decrease estrogen levels, by ovariectomy premenopausally and by use of anti-estrogens and progestational agents both pre- and post-menopausally; and these interventions lead to decreased tumor mass or delayed progression of tumor growth in some women. Inhibition of aromatase activity is primarily due to anastrozole, the parent drug. Studies with radiolabeled drug have demonstrated that orally administered anastrozole is well absorbed into the systemic circulation with 83 to 85% of the radiolabel recovered in urine and feces. Food does not affect the extent of absorption. Elimination of anastrozole is primarily via hepatic metabolism (approximately 85%) and to a lesser extent, renal excretion (approximately 11%), and anastrozole has a mean terminal elimination half-life of approximately 50 hours in postmenopausal women. The major circulating metabolite of anastrozole, triazole, lacks pharmacologic activity. The pharmacokinetic parameters are similar in patients and in healthy postmenopausal volunteers. The pharmacokinetics of anastrozole are linear over the dose range of 1 to 20 mg and do not change with repeated dosing. Consistent with the approximately 2-day terminal elimination half-life, plasma concentrations approach steady-state levels at about 7 days of once daily dosing and steady-state levels are approximately three- to four-fold higher than levels observed after a single dose of ARIMIDEX. Anastrozole is 40% bound to plasma proteins in the therapeutic range. Studies in postmenopausal women demonstrated that anastrozole is extensively metabolized with about 10% of the dose excreted in the urine as unchanged drug within 72 hours of dosing, and the remainder (about 60% of the dose) is excreted in urine as metabolites. Metabolism of anastrozole occurs by N-dealkylation, hydroxylation and glucuronidation. Three metabolites of anastrozole have been identified in human plasma and urine. The known metabolites are triazole, a glucuronide conjugate of hydroxy-anastrozole, and a glucuronide of anastrozole itself. Several minor (less than 5% of the radioactive dose) metabolites have not been identified. Because renal elimination is not a significant pathway of elimination, total body clearance of anastrozole is unchanged even in severe (creatinine clearance less than 30 mL/min/1.73m 2 ) renal impairment, dosing adjustment in patients with renal dysfunction is not necessary (see Special Populations and DOSAGE AND ADMINISTRATION sections). Dosage adjustment is also unnecessary in patients with stable hepatic cirrhosis (see Special Populations and DOSAGE AND ADMINISTRATION sections). Anastrozole pharmacokinetics have been investigated in postmenopausal female volunteers and patients with breast cancer. No age related effects were seen over the range <50 to >80 years. Estradiol and estrone sulfate levels were similar between Japanese and Caucasian postmenopausal women who received 1 mg of anastrozole daily for 16 days. Anastrozole mean steady-state minimum plasma concentrations in Caucasian and Japanese postmenopausal women were 25.7 and 30.4 ng/mL, respectively. Anastrozole pharmacokinetics have been investigated in subjects with renal insufficiency. Anastrozole renal clearance decreased proportionally with creatinine clearance and was approximately 50% lower in volunteers with severe renal impairment (creatinine clearance < 30 mL/min/1.73m 2 ) compared to controls. Since only about 10% of anastrozole is excreted unchanged in the urine, the reduction in renal clearance did not influence the total body clearance (See DOSAGE AND ADMINISTRATION ). Hepatic metabolism accounts for approximately 85% of anastrozole elimination. Anastrozole pharmacokinetics have been investigated in subjects with hepatic cirrhosis related to alcohol abuse. The apparent oral clearance (CL/F) of anastrozole was approximately 30% lower in subjects with stable hepatic cirrhosis than in control subjects with normal liver function. However, plasma anastrozole concentrations in the subjects with hepatic cirrhosis were within the range of concentrations seen in normal subjects across all clinical trials (see DOSAGE AND ADMINISTRATION ), so that no dosage adjustment is needed. Anastrozole inhibited reactions catalyzed by cytochrome P450 1A2, 2C8/9, and 3A4 in vitro with Ki values which were approximately 30 times higher than the mean steady-state C max values observed following a 1 mg daily dose. 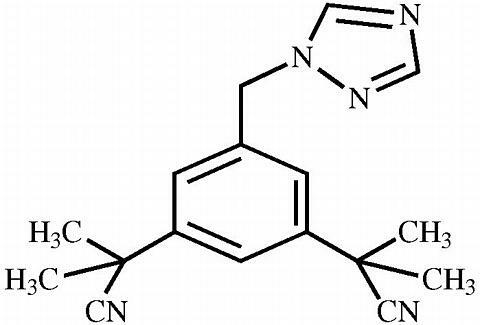 Anastrozole had no inhibitory effect on reactions catalyzed by cytochrome P450 2A6 or 2D6 in vitro . Administration of a single 30 mg/kg or multiple 10 mg/kg doses of anastrozole to healthy subjects had no effect on the clearance of antipyrine or urinary recovery of antipyrine metabolites. Based on these in vitro and in vivo results, it is unlikely that co-administration of ARIMIDEX 1 mg with other drugs will result in clinically significant inhibition of cytochrome P450 mediated metabolism. In a study conducted in 16 male volunteers, anastrozole did not alter the pharmacokinetics as measured by C max and AUC, and anticoagulant activity as measured by prothrombin time, activated partial thromboplastine time, and thrombin time of both R- and S-warfarin. Co-administration of anastrozole and tamoxifen in breast cancer patients reduced anastrozole plasma concentration by 27% compared to those achieved with anastrozole alone; however, the coadministration did not affect the pharmacokinetics of tamoxifen or N-desmethyltamoxifen (see PRECAUTIONS - Drug Interactions ). Effect on Estradiol: Mean serum concentrations of estradiol were evaluated in multiple daily dosing trials with 0.5, 1, 3, 5, and 10 mg of ARIMIDEX in postmenopausal women with advanced breast cancer. Clinically significant suppression of serum estradiol was seen with all doses. Doses of 1 mg and higher resulted in suppression of mean serum concentrations of estradiol to the lower limit of detection (3.7 pmol/L). The recommended daily dose, ARIMIDEX 1 mg, reduced estradiol by approximately 70% within 24 hours and by approximately 80% after 14 days of daily dosing. Suppression of serum estradiol was maintained for up to 6 days after cessation of daily dosing with ARIMIDEX 1 mg. The effect of ARIMIDEX on estradiol levels in premenopausal women has not been studied. Because aromatization of adrenal androgens is not a significant source of estradiol in premenopausal women (women with functioning ovaries as evidenced by menstruation and/or premenopausal LH, FSH and estradiol levels), ARIMIDEX would not be expected to lower estradiol levels in premenopausal women. Adjuvant Treatment of Breast Cancer in Postmenopausal Women: A multicenter, double-blind trial (ATAC) randomized 9,366 postmenopausal women with operable breast cancer to adjuvant treatment with ARIMIDEX 1 mg daily, tamoxifen 20 mg daily, or a combination of the two treatments for five years or until recurrence of the disease. At the time of the efficacy analysis, women had received a median of 31 months of treatment and had been followed for recurrence-free survival for a median of 33 months. The primary endpoint of the trial is recurrence-free survival, ie, time to occurrence of a distant or local recurrence, or contralateral breast primary or death from any cause. Time to distant recurrence and the incidence of contralateral breast primaries were analyzed. Demographic and other baseline characteristics were similar among the three treatment groups (see Table 1). 4 Among the patients who had breast conservation, radiotherapy was administered to 95.0% of patients in the ARIMIDEX arm, 94.1% in the tamoxifen arm and 94.5% in the ARIMIDEX plus tamoxifen arm. The recommended duration of tamoxifen therapy is five years; continued benefit of tamoxifen after 3 years has been documented. The results of the ATAC trial in a patient population treated for a median of 31 months, thus allow only a preliminary comparison of ARIMIDEX and tamoxifen therapy. At this time, recurrence-free survival was improved in the ARIMIDEX arm compared to the tamoxifen arm: Hazard Ratio (HR) = 0.83, 95% CI 0.71-0.96, p=0.0144. Results were essentially the same in the hormone receptor positive patients (about 84% of the patients): HR=0.78, 95% CI 0.65-0.93. Recurrence-free survival in the combination treatment arm was similar to that in the tamoxifen group. Duration of follow-up in this ongoing trial is too short to permit a mature survival analysis. The duration of therapy on the study arms and frequency of individual events comprising recurrence are described in Table 2. First Line Therapy in Postmenopausal Women with Advanced Breast Cancer: Two double-blind, well-controlled clinical studies of similar design (0030, a North American study and 0027, a predominately European study) were conducted to assess the efficacy of ARIMIDEX compared with tamoxifen as first-line therapy for hormone receptor positive or hormone receptor unknown locally advanced or metastatic breast cancer in postmenopausal women. A total of 1021 patients between the ages of 30 and 92 years old were randomized to receive trial treatment. Patients were randomized to receive 1 mg of ARIMIDEX once daily or 20 mg of tamoxifen once daily. The primary end points for both trials were time to tumor progression, objective tumor response rate, and safety. For the primary endpoints, trial 0030 showed ARIMIDEX was at least as effective as tamoxifen for objective tumor response rate. 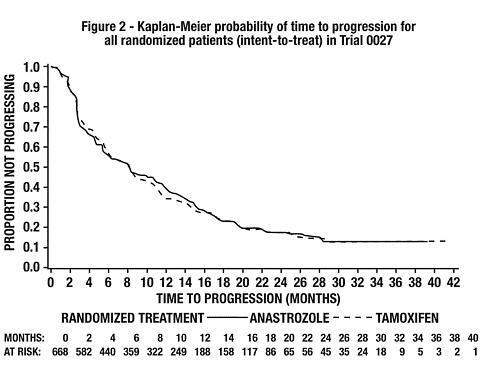 ARIMIDEX had a statistically significant advantage over tamoxifen (p=0.006) for time to tumor progression (see Table 4 and Figure 1). 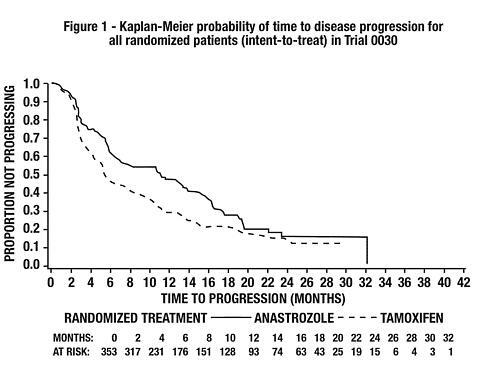 Trial 0027 showed ARIMIDEX was at least as effective as tamoxifen for objective tumor response rate and time to tumor progression (See Table 4 and Figure 2). Table 4 below summarizes the results of trial 0030 and trial 0027 for the primary efficacy endpoints. Results from the secondary endpoints of time to treatment failure, duration of tumor response, and duration of clinical benefit were supportive of the results of the primary efficacy endpoints. There were too few deaths occurring across treatment groups of both trials to draw conclusions on overall survival differences. Second Line Therapy in Postmenopausal Women with Advanced Breast Cancer who had Disease Progression following Tamoxifen Therapy: Anastrozole was studied in two well-controlled clinical trials (0004, a North American study; 0005, a predominately European study) in postmenopausal women with advanced breast cancer who had disease progression following tamoxifen therapy for either advanced or early breast cancer. Some of the patients had also received previous cytotoxic treatment. Most patients were ER-positive; a smaller fraction were ER-unknown or ER-negative; the ER-negative patients were eligible only if they had had a positive response to tamoxifen. Eligible patients with measurable and non-measurable disease were randomized to receive either a single daily dose of 1 mg or 10 mg of ARIMIDEX or megestrol acetate 40 mg four times a day. The studies were double-blinded with respect to ARIMIDEX. Time to progression and objective response (only patients with measurable disease could be considered partial responders) rates were the primary efficacy variables. Objective response rates were calculated based on the Union Internationale Contre le Cancer (UICC) criteria. The rate of prolonged (more than 24 weeks) stable disease, the rate of progression, and survival were also calculated. As shown in the table below, similar results were observed among treatment groups and between the two trials. None of the within-trial differences were statistically significant. More than 1/3 of the patients in each treatment group in both studies had either an objective response or stabilization of their disease for greater than 24 weeks. Among the 263 patients who received ARIMIDEX 1 mg, there were 11 complete responders and 22 partial responders. In patients who had an objective response, more than 80% were still responding at 6 months from randomization and more than 45% were still responding at 12 months from randomization. Objective response rates and median times to progression and death for ARIMIDEX 1 mg were similar to megestrol acetate for women over or under 65. There were too few non-white patients studied to draw conclusions about racial differences in response. ARIMIDEX is indicated for adjuvant treatment of postmenopausal women with hormone receptor positive early breast cancer. The effectiveness of ARIMIDEX in early breast cancer is based on an analysis of recurrence-free survival in patients treated for a median of 31 months (see CLINICAL PHARMACOLOGY - Clinical Studies subsection). Further follow-up of study patients will be required to determine long-term outcomes. ARIMIDEX is indicated for the first-line treatment of postmenopausal women with hormone receptor positive or hormone receptor unknown locally advanced or metastatic breast cancer. ARIMIDEX is contraindicated in any patient who has shown a hypersensitivity reaction to the drug or to any of the excipients. ARIMIDEX can cause fetal harm when administered to a pregnant woman. Anastrozole has been found to cross the placenta following oral administration of 0.1 mg/kg in rats and rabbits (about 1 and 1.9 times the recommended human dose, respectively, on a mg/m 2 basis). Studies in both rats and rabbits at doses equal to or greater than 0.1 and 0.02 mg/kg/day, respectively (about 1 and 1/3, respectively, the recommended human dose on a mg/m 2 basis), administered during the period of organogenesis showed that anastrozole increased pregnancy loss (increased pre- and/or post-implantation loss, increased resorption, and decreased numbers of live fetuses); effects were dose related in rats. Placental weights were significantly increased in rats at doses of 0.1 mg/kg/day or more. Evidence of fetotoxicity, including delayed fetal development (i.e., incomplete ossification and depressed fetal body weights), was observed in rats administered doses of 1 mg/kg/day (which produced plasma anastrozole C ssmax and AUC 0-24 hr that were 19 times and 9 times higher than the respective values found in postmenopausal volunteers at the recommended dose). There was no evidence of teratogenicity in rats administered doses up to 1.0 mg/kg/day. In rabbits, anastrozole caused pregnancy failure at doses equal to or greater than 1.0 mg/kg/day (about 16 times the recommended human dose on a mg/m 2 basis); there was no evidence of teratogenicity in rabbits administered 0.2 mg/kg/day (about 3 times the recommended human dose on a mg/m 2 basis). There are no adequate and well-controlled studies in pregnant women using ARIMIDEX. If ARIMIDEX is used during pregnancy, or if the patient becomes pregnant while receiving this drug, the patient should be apprised of the potential hazard to the fetus or potential risk for loss of the pregnancy. ARIMIDEX is not recommended for use in premenopausal women as safety and efficacy has not been established (see CLINICAL PHARMACOLOGY , Pharmacodynamics , Effect on Estradiol section). Before starting treatment with ARIMIDEX, pregnancy must be excluded (see WARNINGS ). ARIMIDEX should be administered under the supervision of a qualified physician experienced in the use of anticancer agents. Results from the ATAC trial bone substudy, at 12 and 24 months demonstrated that patients receiving ARIMIDEX had a mean decrease in both lumbar spine and total hip bone mineral density (BMD) compared to baseline. Patients receiving tamoxifen had a mean increase in both lumbar spine and total hip BMD compared to baseline. During the ATAC trial, more patients receiving ARIMIDEX were reported to have an elevated serum cholesterol compared to patients receiving tamoxifen (7% versus 3%, respectively). (See CLINICAL PHARMACOLOGY ) Anastrozole inhibited in vitro metabolic reactions catalyzed by cytochromes P450 1A2, 2C8/9, and 3A4 but only at relatively high concentrations. Anastrozole did not inhibit P450 2A6 or the polymorphic P450 2D6 in human liver microsomes. Anastrozole did not alter the pharmacokinetics of antipyrine. Although there have been no formal interaction studies other than with antipyrine, based on these in vivo and in vitro studies, it is unlikely that co-administration of a 1 mg dose of ARIMIDEX with other drugs will result in clinically significant drug inhibition of cytochrome P450-mediated metabolism of the other drugs. An interaction study with warfarin showed no clinically significant effect of anastrozole on warfarin pharmacokinetics or anticoagulant activity. Clinical and pharmacokinetic results from the ATAC trial suggest that tamoxifen should not be administered with anastrozole (see CLINICAL PHARMACOLOGY - Drug Interactions and Clinical Studies subsections). Co-administration of anastrozole and tamoxifen resulted in a reduction of anastrozole plasma levels by 27% compared with those achieved with anastrozole alone. Estrogen-containing therapies should not be used with ARIMIDEX as they may diminish its pharmacologic action. No clinically significant changes in the results of clinical laboratory tests have been observed. A conventional carcinogenesis study in rats at doses of 1.0 to 25 mg/kg/day (about 10 to 243 times the daily maximum recommended human dose on a mg/m 2 basis) administered by oral gavage for up to 2 years revealed an increase in the incidence of hepatocellular adenoma and carcinoma and uterine stromal polyps in females and thyroid adenoma in males at the high dose. A dose related increase was observed in the incidence of ovarian and uterine hyperplasia in females. At 25 mg/kg/day, plasma AUC 0-24 hr levels in rats were 110 to 125 times higher than the level exhibited in postmenopausal volunteers at the recommended dose. A separate carcinogenicity study in mice at oral doses of 5 to 50 mg/kg/day (about 24 to 243 times the daily maximum recommended human dose on a mg/m 2 basis) for up to 2 years produced an increase in the incidence of benign ovarian stromal, epithelial and granulosa cell tumors at all dose levels. A dose related increase in the incidence of ovarian hyperplasia was also observed in female mice. These ovarian changes are considered to be rodent-specific effects of aromatase inhibition and are of questionable significance to humans. The incidence of lymphosarcoma was increased in males and females at the high dose. At 50 mg/kg/day, plasma AUC levels in mice were 35 to 40 times higher than the level exhibited in postmenopausal volunteers at the recommended dose. Oral administration of anastrozole to female rats (from 2 weeks before mating to pregnancy day 7) produced significant incidence of infertility and reduced numbers of viable pregnancies at 1 mg/kg/day (about 10 times the recommended human dose on a mg/m 2 basis and 9 times higher than the AUC 0-24 hr found in postmenopausal volunteers at the recommended dose). Pre-implantation loss of ova or fetus was increased at doses equal to or greater than 0.02 mg/kg/day (about one-fifth the recommended human dose on a mg/m 2 basis). Recovery of fertility was observed following a 5-week non-dosing period which followed 3 weeks of dosing. It is not known whether these effects observed in female rats are indicative of impaired fertility in humans. Multiple-dose studies in rats administered anastrozole for 6 months at doses equal to or greater than 1 mg/kg/day (which produced plasma anastrozole C ssmax and AUC 0-24 hr that were 19 and 9 times higher than the respective values found in postmenopausal volunteers at the recommended dose) resulted in hypertrophy of the ovaries and the presence of follicular cysts. In addition, hyperplastic uteri were observed in 6-month studies in female dogs administered doses equal to or greater than 1 mg/kg/day (which produced plasma anastrozole C ssmax and AUC 0-24 hr that were 22 times and 16 times higher than the respective values found in postmenopausal women at the recommended dose). It is not known whether these effects on the reproductive organs of animals are associated with impaired fertility in premenopausal women. It is not known if anastrozole is excreted in human milk. Because many drugs are excreted in human milk, caution should be exercised when ARIMIDEX is administered to a nursing woman (See WARNINGS and PRECAUTIONS ). The safety and efficacy of ARIMIDEX in pediatric patients have not been established. In studies 0030 and 0027 about 50% of patients were 65 or older. Patients >/= 65 years of age had moderately better tumor response and time to tumor progression than patients < 65 years of age regardless of randomized treatment. In studies 0004 and 0005 50% of patients were 65 or older. Response rates and time to progression were similar for the over 65 and younger patients. In the ATAC adjuvant study, 35% of patients were <60 years of age; 38% were >/= 60 to </= 70 years of age; and 27% were > 70 years of age. The number of events by age group was insufficient to perform a subset efficacy analysis. The median duration of adjuvant treatment for safety evaluation was 37.3 months, 36.9 months, and 36.5 months for patients receiving ARIMIDEX 1 mg, tamoxifen 20 mg, and the combination of ARIMIDEX 1 mg plus tamoxifen 20 mg, respectively. Adverse events occurring with an incidence of at least 5% in any treatment group during treatment or within 14 days of the end of treatment are presented in Table 7. *A patient may have had more than 1 adverse event, including more than 1 adverse event in the same body system. Non-pathologic fractures were reported more frequently in the ARIMIDEX-treated patients (219 [7%]) than in the tamoxifen-treated patients (137 [4%]). Certain adverse events and combinations of adverse events were prospectively specified for analysis, based on the known pharmacologic properties and side effect profiles of the two drugs (See table 8). Patients receiving ARIMIDEX had an increase in musculoskeletal events and fractures (including fractures of spine, hip and wrist) compared with patients receiving tamoxifen. Patients receiving ARIMIDEX had a decrease in hot flashes, vaginal bleeding, vaginal discharge, endometrial cancer, venous thromboembolic events (including deep venous thrombosis) and ischemic cerebrovascular events compared with patients receiving tamoxifen. 1 Refers to joint symptoms, including arthritis, arthrosis and arthralgia. Angina pectoris was reported more frequently in the ARIMIDEX-treated patients (52 [1.7%]) than in the tamoxifen-treated patients (30 [1.0%]); the incidence of myocardial infarction was comparable (ARIMIDEX 24 patients [0.8%]; tamoxifen 25 patients [0.8%]). ARIMIDEX was generally well tolerated in two well-controlled clinical trials (ie, Trials 0030 and 0027). Adverse events occurring with an incidence of at least 5% in either treatment group of trials 0030 and 0027 during or within 2 weeks of the end of treatment are shown in Table 9.
a A patient may have had more than 1 adverse event. Based on results from second-line therapy and the established safety profile of tamoxifen, the incidences of 9 prespecified adverse event categories potentially causally related to one or both of the therapies because of their pharmacology were statistically analyzed. No significant differences were seen between treatment groups. Despite the lack of estrogenic activity for ARIMIDEX, there was no increase in myocardial infarction or fracture when compared with tamoxifen. ARIMIDEX was generally well tolerated in two well-controlled clinical trials (ie, Trials 0004 and 0005), with less than 3.3% of the ARIMIDEX-treated patients and 4.0% of the megestrol acetate-treated patients withdrawing due to an adverse event. **/* A patient may have more than one adverse event. Other less frequent (2% to 5%) adverse experiences reported in patients receiving ARIMIDEX 1 mg in either Trial 0004 or Trial 0005 are listed below. These adverse experiences are listed by body system and are in order of decreasing frequency within each body system regardless of assessed causality. The incidences of the following adverse event groups potentially causally related to one or both of the therapies because of their pharmacology, were statistically analyzed: weight gain, edema, thromboembolic disease, gastrointestinal disturbance, hot flushes, and vaginal dryness. These six groups, and the adverse events captured in the groups, were prospectively defined. The results are shown in the table below. More patients treated with megestrol acetate reported weight gain as an adverse event compared to patients treated with ARIMIDEX 1 mg (p<0.0001). Other differences were not statistically significant. An examination of the magnitude of change in weight in all patients was also conducted. Thirty-four percent (87/253) of the patients treated with megestrol acetate experienced weight gain of 5% or more and 11% (27/253) of the patients treated with megestrol acetate experienced weight gain of 10% or more. Among patients treated with ARIMIDEX 1 mg, 13% [33/262] experienced weight gain of 5% or more and 3% [6/262] experienced weight gain of 10% or more. On average, this 5 to 10% weight gain represented between 6 and 12 pounds. No patients receiving ARIMIDEX or megestrol acetate discontinued treatment due to drug-related weight gain. Vaginal bleeding has been reported infrequently, mainly in patients during the first few weeks after changing from existing hormonal therapy to treatment with ARIMIDEX. If bleeding persists, further evaluation should be considered. During clinical trials and postmarketing experience joint pain/stiffness has been reported in association with the use of ARIMIDEX. ARIMIDEX may also be associated with rash including very rare cases of mucocutaneous disorders such as erythema multiforme and Stevens-Johnson syndrome. Very rare cases of allergic reactions including angioedema, urticaria and anaphylaxis have been reported in patients receiving ARIMIDEX. Clinical trials have been conducted with ARIMIDEX, up to 60 mg in a single dose given to healthy male volunteers and up to 10 mg daily given to postmenopausal women with advanced breast cancer; these dosages were well tolerated. A single dose of ARIMIDEX that results in life-threatening symptoms has not been established. In rats, lethality was observed after single oral doses that were greater than 100 mg/kg (about 800 times the recommended human dose on a mg/m 2 basis) and was associated with severe irritation to the stomach (necrosis, gastritis, ulceration, and hemorrhage). In an oral acute toxicity study in the dog the median lethal dose was greater than 45 mg/kg/day. There is no specific antidote to overdosage and treatment must be symptomatic. In the management of an overdose, consider that multiple agents may have been taken. Vomiting may be induced if the patient is alert. Dialysis may be helpful because ARIMIDEX is not highly protein bound. General supportive care, including frequent monitoring of vital signs and close observation of the patient, is indicated. The dose of ARIMIDEX is one 1 mg tablet taken once a day. For patients with advanced breast cancer, ARIMIDEX should be continued until tumor progression. For adjuvant treatment of early breast cancer in postmenopausal women, the optimal duration of therapy is unknown. The median duration of therapy at the time of data analysis was 31 months; the ongoing ATAC trial is planned for five years of treatment. (See CLINICAL PHARMACOLOGY ) Hepatic metabolism accounts for approximately 85% of anastrozole elimination. Although clearance of anastrozole was decreased in patients with cirrhosis due to alcohol abuse, plasma anastrozole concentrations stayed in the usual range seen in patients without liver disease. Therefore, no changes in dose are recommended for patients with mild-to-moderate hepatic impairment, although patients should be monitored for side effects. ARIMIDEX has not been studied in patients with severe hepatic impairment. White, biconvex, film-coated tablets containing 1 mg of anastrozole. The tablets are impressed on one side with a logo consisting of a letter "A" (upper case) with an arrowhead attached to the foot of the extended right leg of the "A" and on the reverse with the tablet strength marking "Adx 1". These tablets are supplied in bottles of 30 tablets (NDC 0310-0201-30). ARIMIDEX is a trademark of the Astrazeneca group of companies.